Many artists who are just getting their start dream of one day touring, whether it’s locally, nationally or globally. But opportunities can be limited, promotion can be hard work and logistics can get increasingly complicated with every show you book. And, let’s be honest. It’s not just the artists who are affected by all the complexity and challenges involved. Venues, agents and sound engineers also play a part in making a tour a success. 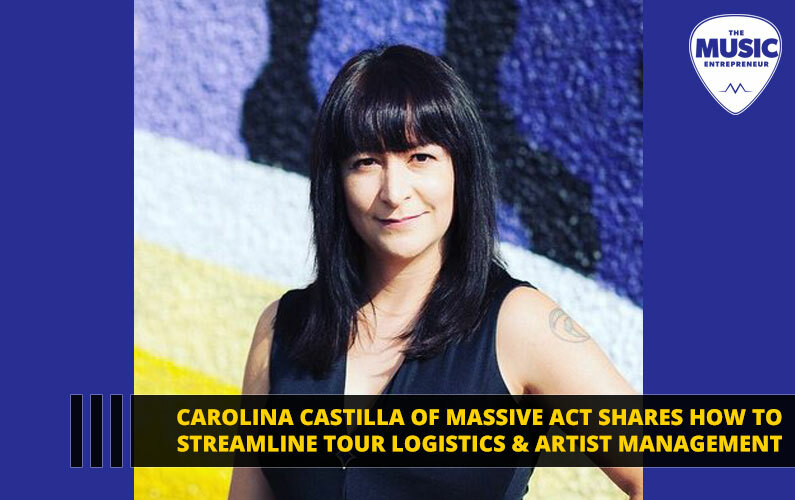 So, whether it’s connecting with venues and event organizers, gaining publicity opportunities or building your EPK and tech rider, Massive Act is a tool you can leverage to grow your career. Here’s Carolina Castilla to share more about it. I’m a Colombian entrepreneur who has worked in the industry wearing many hats: manager, festival producer, PR, and hospitality manager. Over the years, I had the good fortune of seeing amazing talent in Latin America and I created this with the idea of opening the doors for those who can’t find resources or the network. Our platform connects and brings the real-world, live-music professional ecosystem to the music industry. We give artists all the technical support they need to tour professionally and perform for massive crowds. We offer a workflow solution between the parts involved but also a marketplace. 2. What is Massive Act? How does it benefit artists, venues and sound engineers? We streamline the process of performing. Festivals and venues can curate artists, then they communicate logistics like sound checks, lineup order, transportation, and hospitality. Artists can work with sound engineers to create technical riders (how they stand on the stage, how they are connected to the mixer), and the backstage team of the festival can see and work with the artist and their needs. 3. How can current tech address tour logistics? Actually, artists and tour managers use different software technologies and tons of emails. Our product is designed to support the artist before and after they get booked. Our networking feature called “perform” allows them to connect with venues, festivals and gannets by location and genre, so not only can the artist apply to opportunities, they can request connections with talent buyers all over the world. If an artist is booked in Brazil, we provide the information of similar festivals or venues in Chile or Argentina to help the artist book more gigs and make the tour worth it. 4. How can artist management be hacked? Our system is useful not only for artists and tour crews; the managers can benefit too. First we offer the profile, which is like the business brochure of the artist. Then we give them the opportunity to communicate their technical needs to talent buyers inside and outside of the platform. Then we give them the database of venues, festivals and talent buyers launching opportunities, so when the talent buyers look at the artist profile, their information is enough to book them. 5. Please speak to the joys and struggles of being a female entrepreneur. How does emotional intelligence help? It’s been pretty amazing seeing the system working. There are too many ideas and startups that don’t pass the concept line. The team we have has pretty strong diversity; it makes me happy to work with people from all over the world. It feels good, too, when you receive positive feedback from users; our priority is built based on their needs. At the beginning of this journey, when I was learning what was working with very smart people, I had to prove who I was and why this idea I had would work. The best way I use my emotional intelligence is to understand what the team likes to do or hates doing; that way I can manage a very collaborative environment. Will brands and media be part of Massive Act’s ecosystem, taking into account that live music is the biggest revenue generator in the music business? Yes, in the future we will add them to the ecosystem and streamline the processes for sponsorships, endorsements, and publications. Who doesn’t want to perform for massive crowds? I know I’d love to. And, if you’re got any thoughts or questions, please leave them in the comments below. I look forward to sharing our next The Music Entrepreneur HQ exclusive.